Get ready to dazzle those open-toe and open-heel shoes! This simple and aromatic foot scrub will help you put your best foot forward! Now, all you need to do is find a container for your scrub, mix up your ingredients and you are DONE! 1. Soak your feet in warm water for about 10 minutes. The water does not need to be hot, just warm. You can add some Epsom Salts into your soak water for extra softening power! 2. Get out a generous scoop of your glorious scrub and work over your foot, be somewhat more aggressive on areas of thickened skin, and be more gentle on more delicate skin – especially on the top of your feet – don’t overdo it! Repeat on your other foot. 3. Rinse away salt and excess oil with warm water. You can use the tiniest amount of body wash to help lift excess oil from the skin, but this should be minimal – leave some of the oil in place. 4. Perform a gentle filing of both feet using either a pumice stone or a gentle foot file. Focus on your heels and areas of hardened, thickened skin. Do not file the tops of your feet! Rinse your feet again with warm water. 5. Apply moisturizer to your feet. One of the best topical treatments for dry feet is 100% pure, unrefined Shea Butter. Now, Shea Butter is thick, and you don’t want to be getting it all over the place, so I recommend that you do this just before bed, throw on a pair of comfy socks – and sleep in the Shea Butter. If you’re not heading straight to bed, and can’t really roam around in socks, just go for a nice moisturizing lotion. But, using the Shea Butter and sleeping in it will improve your feet tremendously. These DIY jobs are always much more fun when you have a nice container! Specialty mason jars are a fun way to store your scrubs. But, on the quick, a plain old plastic container with a lid will do. It is quite alright to play with this recipe a bit and switch up the type of essential oils you use. Lemon and lime are other nice options for a citrus flare. Be cautious with your essential oils, however. Essential oils are very concentrated, so start on the lower end of the drops – and add more if you need it. Do NOT use this scrub on your face or body. I am not a fan of the overuse of salt on the skin of the body. Salt can be drying and too abrasive for scrubbing more delicate skin. Opt for sugar scrubs like my Olive Oil and Lemon Scrub for the skin of your body, and use ONLY professional exfoliants for your face/neck/decolette. 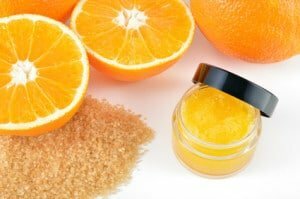 I hope you’ll enjoy this fabulous Citrus Foot Scrub! If you have any questions, please feel free to comment below!